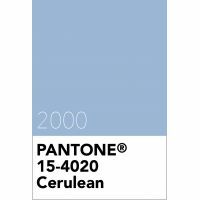 Pantone announces it's first Colour of the Year for 2000 is Cerulean Blue, the colour for the millennium. The official colour of the millennium and Pantone's inaugural colour of the year is Cerulean Blue PANTONE 15-4020. Cerulean reflects the colour of the sky on a serene, crystal clear day. Lifestyle movements suggest that consumers will be seeking inner peace and spiritual fulfilment in 2000. The new millennium is a paradoxical time in which we are heading toward an uncertain, yet exciting, future, and also looking back, trying to hold onto the security of the past. In this stressful, high-tech era, people will be searching for solace and Cerulean Blue produces the perfect calming effect. Pantone Institute studies show that blue is the leading favourite colour for designers and consumers around the world, transcending culture or gender. The viewing of blue creates a calming effect and could help to reduce blood pressure, heartbeat and respiration rates. Psychologically, gazing at a clear blue sky brings a sense of peace and tranquillity to the human spirit. Surrounding yourself with Cerulean blue could bring on a certain peace because it reminds us of time spent outdoors, on the beach, near water and sparks associations with restful, peaceful, relaxing times, making the unknown a little less frightening. Cerulean Blue 15-4020 is from the Pantone Fashion, Home + Interiors colour library.